People on social media erupted in outrage during the weekend, calling the picture being distributed on Snapchat racist and "not OK."
SARASOTA, Fla. -- Teens' so-called "promposals" range from sweet and subtle to over-the-top and elaborate. This promposal purportedly from a Sarasota high school student might be in a class all its own. The teen's poster reads: "If I was black I'd be picking cotton, but I'm white so I'm picking u 4 prom?" People on social media erupted in outrage during the weekend, calling the picture being distributed on Snapchat racist and "not OK." On one particular Twitter thread (warning: language), some people said they didn't see what was wrong and thought it was funny. 10News is not identifying the student in its reporting because he is a minor. It wasn't too humorous to Kathy Wilks, acting principal of Riverview High School, who sent a letter to parents Monday morning. "We want to make everyone aware of a student’s social media post that has caused a very concerning situation. It involves one of our seniors and his 'promposal' to another student. It was racial in nature and administration became aware of it last night. The student’s post is under investigation by administration; the parents of the students involved have been contacted and appropriate action will be taken based on the investigation. We are focused on ensuring that Riverview High School provides a safe and secure environment for all of our students and that all students feel welcome and understand the value that they all bring to our school community. Our guidance counselors and administrators are available for any student who wish to speak to someone regarding the issue. Riverview’s prom is scheduled for May 5 at the Hyatt Regency Sarasota, according to the district’s website. In the hours since the photo circulated online and was picked up by the media, another photo believed to be posted by the teen shows an apology -- but not one being bought by others online. "I want to sincerely apologize if I have offended anyone with the picture going around. That was not my intention. Anyone who knows me or ***** [edited by 10News] knows that that's not how we truly feel. It was a completely joke and it went too far. "After reading the texts and Snapchat's I truly see how I have offended people and I'm sorry." 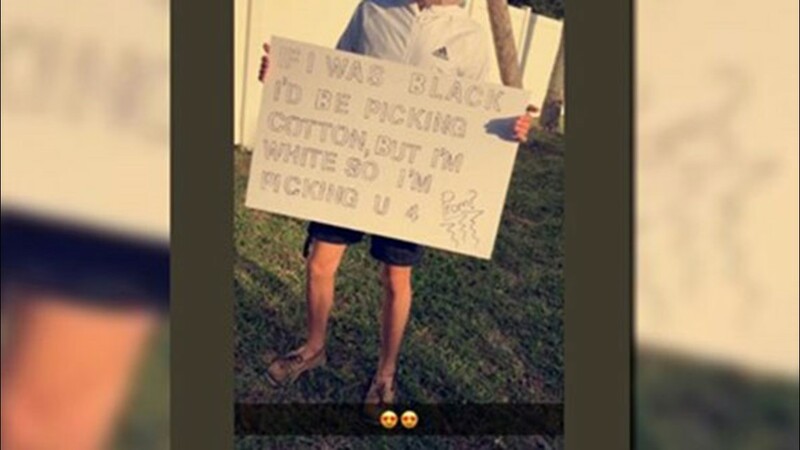 A teen who is said to be a Sarasota high school student holds a poster many are calling a blatantly racist "promposal." It reads: "If I was black I'd be picking cotton, but I'm white so I'm picking u 4 prom?" 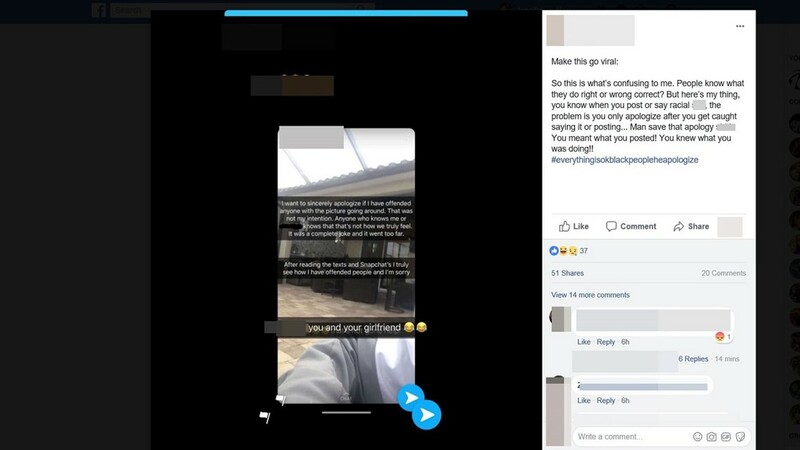 A teen believed to have posted a racist "promposal" message since is apologizing on social media. A reply on Facebook says: "Man save that apology ... you meant what you posted!" The school district said, in part, "This incident remains an on-going investigation and any disciplinary action and recommendation will be made accordingly. "... Likewise, the school district is working with local and national civic leaders, including the NAACP, to develop a roundtable forum to discuss the issue of race – not just at Riverview, but district-wide." A similar promposal received just as much outrage in March 2017 in South Florida as three girls at Monarch High School in Coconut Creek, Florida, held a sign reading, "You may be picking cotton, but we're picking you to go to prom with us." Two of the girls were suspended.